(which may be added as a course to the full congress registration at no charge). The field of Orofacial Myofunctional Therapy (OMT) has recently gained more attention as an emerging adjunct treatment for sleep disordered breathing (SDB). With early randomised studies consistently showing efficacy of OMT in the reduction of AHI and the increase in SaO2 (Guimares 2009, Villa 2014, Camacho 2015), significant reduction of snoring (Ieto 2015), and improvement in CPAP adherence and performance (Diaferia 2016, Cao 2017). Additional recent work considering the potential correlation of orofacial myofunctional disorders (OMDs) to OSA pathogenesis such as mouth breathing (Guilleminault 2014, 2015, 2016, 2017, Lee 2015, Torre 2017) and ankyloglossia (Huang 2015, Guilleminault 2016, Yoon 2017) holds great promise for early identification of patient risk and successful and stable intervention in treatment and potential reversal of SDB. 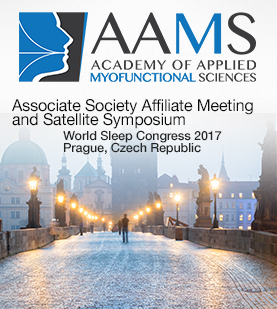 Such early work has led to the increasing adoption of OMT as a standard of care, both adjunct and as a 1st line treatment for SDB (Brazilian Sleep Association/ABSONO 2013, Asian Paediatric Pulmonary Society/APPS 2016, French Society of Research and Sleep Medicine/SFRMS 2016, Italian Ministry of Health 2016), but a great deal more work must be done to establish the science necessary for OMT to become widely accepted. This symposium will review the current uses of OMT related to SDB around the world and also look to ask what is necessary for this promising field to gain greater prominence and use. 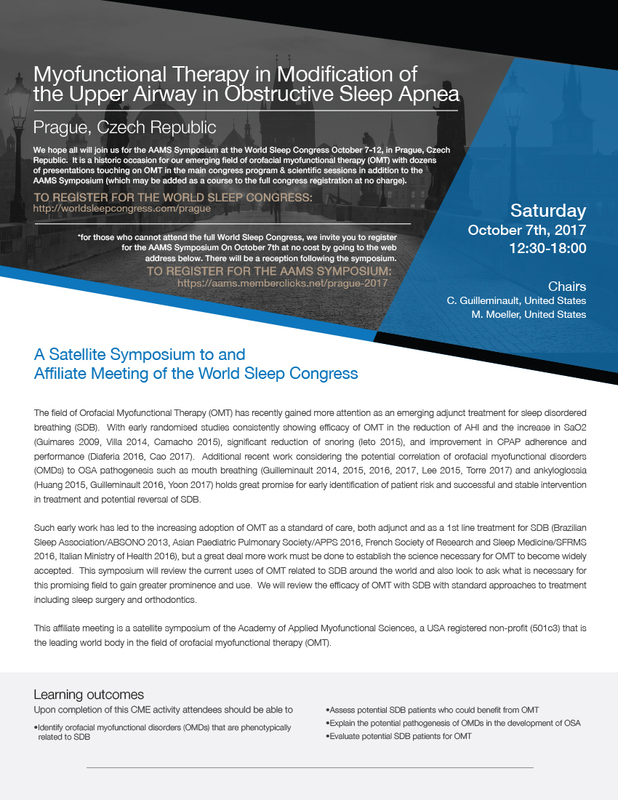 We will review the efficacy of OMT with SDB with standard approaches to treatment including sleep surgery and orthodontics. 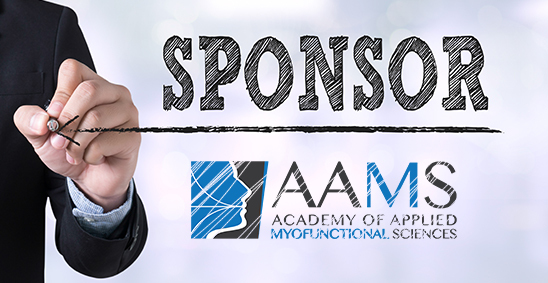 This affiliate meeting is a satellite symposium of the Academy of Applied Myofunctional Sciences, a USA registered non-profit (501c3) that is the leading world body in the field of orofacial myofunctional therapy (OMT). Click on the picture above to download a full flyer of the event. Sponsorship descriptions and respective benefits. The Sleep Medicine and Research Foundation offers sponsorship opportunities for this event. Sponsorship at this event gives you an opportunity to connect with your target audience, the academic community, the general public as well as allowing you to build networking relationships with interdisciplinary, allied health professionals and respective trade associations. Your sponsorship will also help support structured advancement and training required to help thousands of people suffering from sleep disorders. Construction of the New Town Hall started shortly after the founding of New Town by Charles IV in 1348. Over the centuries, it has been witness to many historic events, such as the first Prague Defenestration in 1419, which marked the beginning of the Hussite movement. Today, a wide variety of cultural and social events are held in the town hall’s historical premises. From its nearly 70 m high Gothic tower, you get a beautiful view of the New Town and Karlovo Square, the largest square in Prague. The last reconstruction took place in 1976 – 96, when the premises were adapted to suit the needs of the Prague 2 Municipal Office. There are premises for exhibitions, concerts and social events. On the first floor above Mázhaus, there is an auditorium with a similar vault, where the wedding hall is located. In 1962, the New Town Hall was declared a national cultural monument.